The Laurisilva on the Portuguese island of Madeira (off the African coast) has been placed on the list mainly because of its biological diversity. Also it is considered an outstanding relict of a previously widespread laurel forest type. 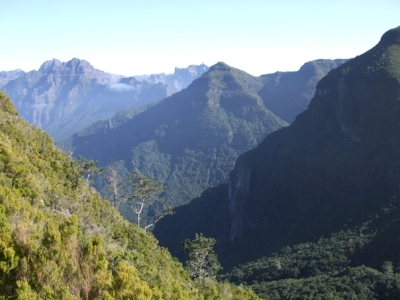 The forest lies between 300 and 1300 m. altitude, and extends across 22.100 hectares of land. Remarkable are its high quality hard wood trees. To see the Laurissilva I took a bus from Madeira's capital Funchal to Ribeiro Frio. This 45-minute ride in the mountains brings you to a part of Madeira where the Laurissilva forest still exists. Due to bad weather (rain, mist) I only did a short walk to Balcoes, and then took the bus back. I'm not much of a tree-specialist, so I publicize here some of my pictures of the forest, hoping there's one of the Laurissilva among them. I explored and enjoyed the primeval forests of Madeira very intensively during my visit in January 2012. I spent almost one week in the forested area of Madeira staying overnight in tent and sleeping bag. The Laurisilva used to cover the entire area of the island (maybe with exception of Sao Lourenco peninsula). Now, it can be found in 4 clusters, and I had opportunity to visit all of them: (1) the large valley of Ribeira Da Janela river. The touristy part of this cluster is Levada das 25 fontes area around Rabacal; (2) Area between Paul da Serra plateau and Sao Vicente; (3) Area between Pico Ruivo and Santana; and (4) quite small cluster around Ribeiro Frio, which is one of the top tourist destination in Madeira. The parts 1-3 are linked together, while the cluster 4 is separated. There are also large areas in the central parts of the island around Pico Ruivo and Pico Grande that were strongly affected by fire, what I could see in 2012. The Laurisilva is very dense forest, but due to a rocky character of Madeira and a presence of levadas one can enjoy wonderfull views there. I like all of the mentioned clusters, but I have maybe the best memories on the cluster No 2, which was the most remote and wildest (see photo). Madeira was my first stop on a December 2016 tour of Portugal and Spain. One experiences this WHS by hiking the ‘levada trails’, which are walking routes that follow man-made irrigation channels known as levadas. The levadas generally flow horizontally along the contours of the hills, with occasional descents down the slopes. The most striking things about driving up from our hotel by the coast up to the laurisilva forests in Madeira’s uplands were the changes in weather and vegetation. The temperature dropped by about 10 degrees and the types of plants we saw changed as we ascended. It was as if it was still summer down at sea level but further up – as the temperature fell – the leaves had turned brown and autumn was well and truly underway. I had only one full day on the island so was only able to hike two trails: Levada 25 Fontes and Levada do Risco - both shrouded in fog. If we had wanted to go walking in cold, foggy conditions we could have stayed in England! These two routes, which start off as one but then fork off individually, led to waterfalls and give a good flavour of the sprawling forests of Madeira. We spent several hours walking along the trials before heading back via road on the north coast to our hotel in Funchal. The levada trails are very pleasant and it is quite unique to experience the placid irrigation channels alongside the path interspersed with roaring waterfalls from the natural rivers. I visited this WHS in November 2015. I will surely remember this WHS as I 'completed' the WHS in Portugal by visiting it. Though I'm fond of this WHS not only for this reason. It has been one of the best European birdwatching destinations together with the Azores. In the inscribed area I managed to see around 7 long-toed pigeons or Trocaz pigeons in flight (from the Balcoes viewpoint) and took photos of another one perched on a laurisilva tree while hiking on the Levada 25 Fontes. I also so several Madeiran firecrests and Madeiran chaffinches there. The easiest way to visit this site is to catch a bus to the troutery or park your rental car nearby in Ribeiro Frio and walk the very easy (yet sometimes muddy) trail to the Balcoes panoramic viewpoint. You can continue the levada trail to Portela but still the best part is only visible from the Balcoes viewpoint. The core is out of bounds for tourists and there are several 500 year old laurisilva trees there. The trail is extremely crowded in the morning, less so in the late afternoon. The highlight here in my opinion is the panoramic viewpoint of the Madeiran peaks, rather than the endemic species and laurisilva forests which are quite far away to be able to appreciate the unique OUV. 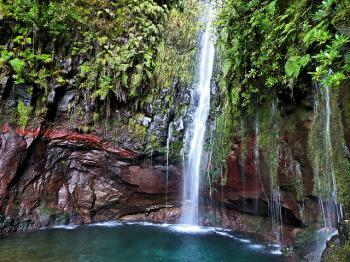 To be able to appreciate the OUV I suggest hiking the Levada 25 Fontes (picture) and the Cabo do Risco trails. Their difficulty is marked as easy to medium and are not suggested for people who suffer from vertigo. Personally I think this is quite an exageration, and I would be more concerned if you suffer from claustrophobia or hate narrow spaces as there are quite a few of them along the trail. I visited early in the morning after 3 days of rainfall. The waterfalls, streams and moisture were at their best and I could truly appreciate the foggy/cloud forest ecosystem at its best. During this trail you're completely surrounded by laurisilva trees, ferns, fungi and mosses. The levada varies from deep to shallow to dug in rock at places. The waterfall at Cabo do Risco is less crowded at all times while I would suggest the 25 Fontes at lunchtime. Apart from the distance marked at the beginning of the trail, you will have to walk another 2km downhill if you want to get a headstart and beat the crowds, most of who catch the shuttle that runs from 09:30 till 17:30. The return trip costs 5 euros while the uphill return trip which I caught after the hike costs 3 euros but is definitely worth it. Another interesting and worthwhile levada trail starts close to Porto Moniz but away from the touristy natural pools. It's called Levada do Janela and is ranked as medium to difficult. I spent 6 days in Madeira but for those who don't have as much time, definitely go for the Levada da 25 Fontes by rental car before 9am if possible and if you're lucky you'll beat the crowds and have a better chance of spotting the rarer endemic birdlife. Madeira is a beautiful island and very popular holiday destination. Though it doesn't offer a whole lot of historic sights, it features a wide range of diverse landscapes and habitats, the most unique of which is the laurel forest. This type of forest disappeared on the European continent during the last Ice Age, but survived on some Atlantic islands such as the Canaries and Madeira. To tick it off, I took a local bus from Funchal to the trout hatchery at Ribeiro Frio, which seems to be crowded with tourists at all times. From there I took the pleasant trail (about 1.5 km one way) through an impressively dense forest to the beautiful Balcoes viewpoint. I also started on the longer trail to Portela, but turned back after a while when it started to rain. Ribeiro Frio is certainly the easiest way to visit this WHS, but for more serious (and fit) hikers than I am, Rabacal and the trail to the 25 Fontes seems to be the best way to experience the laurel forest. It should be noted that although the Madeira Nature Reserve easily covers three quarters of the island, this is not the same as the World Heritage Site, which only covers the remaining pockets of laurisilva, most of which are in the northern part of the island. I found it rather difficult to find a map showing the exact extent of the WHS (even though there is an endless variety of hiking maps available), but the small one I could eventually find definitely included both Ribeiro Frio and Rabacal. On one of my bus trips across the island, I also crossed the forest reserve of Chao dos Louros, also within the WHS, but I couldn't get off there. Madeira is definitely a great island, you can find there plenty of points for leasure, great food and madeira wine. And as well nature. The best how to see the Site is to rent a car (3 days are enough to see the whole island in detail) and drive to Rabacal or Ribeira Frio. 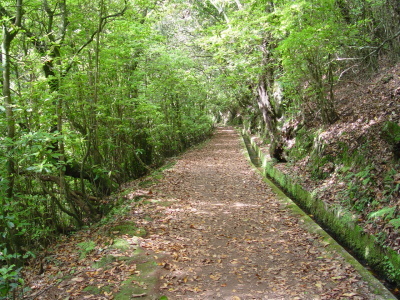 In both locations are very nice Levada tours - which are not difficult for walk and are going through the forests. I have visitd these forests many times. As a young Funchalense, my parents would take me on picnics to Santo da Serra, Poiso, and Ribeiro Frio (very impressive trout hatchery located there), where we would enjoy hiking through these woodlands. These forests are breathtakingly gorgeous. You truly feel like you are in a scene from "Lord of the Rings". The trees are so gnarled and thick, and the air is so fresh and cool. The Madeiran government has done a superlative job preserving these forests and I hope they remain protected for posterity. My only fear is that the extensive and invasive forests of Maritime Pine, Douglas Fir, Chestnut and Eucalyptus found throughout the island don't encroach too closely and compromise these primordial Laurisilva forests. I have been in that area of the Laurisilva Forest and as well all over the island, and very basicaly i can say that it is very beautiful forest, really amazing nature (as well all the island), and should always be preserved. 80 Community Members have visited.